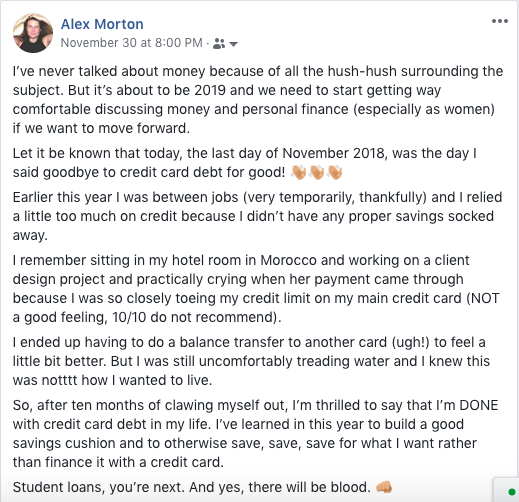 Best moment of November, by far: at the end of the month, when I paid my final $300 payment on my credit card debt! It’d been around for a while, and I’ve finally conquered it! Speaking of which, I think I’m going to start blogging more about personal finance, as well, since I find the topic absolutely fascinating (and I think it should be talked about, too!). I’ve been working the last couple of weeks on a web design for the lovely Marie Johnston. We met about a year ago at the start of B-School (love those B-School connections!) and since we were both in Paris, we met up for coffee. The rest is history! I’m so excited for the launch of this beautiful site and brand! Definitely keep an eye over here for that! I feel so happy to have joined a gym here in Toulouse! After three years as a resident, I figured it was high time to get over myself and join a great salle de sport, as it’s called in French. I love it! I have to say, I went to my first Body Pump weight class in probably close to three years, and my body was FEELING IT afterward. Still so worth it though.